Hrmm, "Feat o' Meat" - that has a nice ring to it. I like it. How about naming it that, or similarly, "Three Feet of Meat"? If you must stick to that silly, worldly, completely logical metric system. how about "Meat-er Long Brat"? C'mon, it's quite possibly the longest, most readily-commercially available meat product out there - have some fun with it! Relatedly, I may have just blown any chance of ever landing a gig with the Fearless Flyer. Drats. This one heckuva monu-meat-al achievement though. As in, it's a seriously good brat. As you can easily tell from my picture, my buddy Nick tossed it on the grill for about a good 20 to 25 mins, flipping halfway through, to get a good, charred, cracked casing. In my opinion, that's really the only way to cook such a thing. The end result was positively mouthwatering: hot, sizzly, juicy, like a sausagey siren bent on leading me and my diet astray. Like any bratwurst worth the name, TJ's beer brat is a good mix of both pork and beef - I can't say exact ratio, but noticeably more pork. It's a good blend, though - not too grainy or rubbery like some I've had, but even and intact inside the pork casing. And, of course, there's beer! Due to silly Quaker-heritage Pennsylvania laws, I haven't had the pleasure of Trader Joe's Vintage Ale too very often, so had to look up what the experts have to say about it. Hrmm, okay, yeasty, bready, some "banana esters" (whatever those are)...okay, I kinda remember that one I had a couple years back. To be honest, I didn't pick up too much of the actual beer flavor in the brats, but I'm willing to bet that's more my palate's shortcomings, as I rarely can in any beer brat. I mean, there was some beery aspects, but not enough to make it super noticeable or give me pause. I more noticed the paprika and peppery aspects than any beer ones. 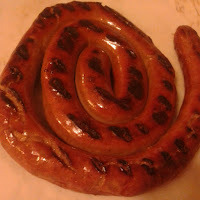 That's all well and good, since the flavor is mild enough to make it prime for pairing with any of your favorite sauces or mustard or whatever, while still enjoyable enough to consume straight up..
All to say, I really enjoyed shuffling off this meat-al coil. I definitely ate more of it than I intended to, I think - my intake modulator wasn't working that night. Good thing it's a great deal - it's over a pound and a half, and costs only $6.99. I'm pretty sure I've seen it around for a while, so hopefully it'll continue to stick around for a bit. Both Sandy and I are wavering around a 4 to a 4.5, so let's call it one of each. This is a really tasty wurst. (Alas, no grill here!) Also good to eat cold, and tastes better than most cold cuts. Sliced in a sandwich with cheese and mustard is a no-brainer bite. Had this at the tasting station and immediately bought some home. Very good and it's a quick easy meal for those lazy days.